Deck-mounted mixing faucets are made of white epoxy/polyester hybrid powder-coated forged brass. They have a serrated hose end, black or color-coded nylon hooded handles, and 1cm (3/8") copper tubes on inlets. Faucets are available with 15.2cm (6") or 20.3cm (8") spread swinging gooseneck, with or without a vacuum breaker. Faucet valves are self-contained renewable units with replaceable stainless steel seats. They have a serrated hose end, black or color-coded nylon hooded handles, and 1 cm (3/8") copper tubes on inlets. 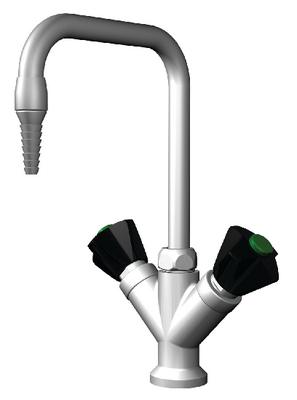 Faucets are available with 15.2 cm (6") or 20.3 cm (8") spread swinging gooseneck, with or without a vacuum breaker.